Looking for an alternative for Skype In? Skype has just written to owners of 0207 SkypeIn numbers to tell them that their number will have to change by 20th December 2007 – a mere month away. 0207 is the dialling prefix for Central London. Although worded in a very friendly way, this bombshell email will not be welcomed by those who rely on SkypeIn to bring calls in to their business. Digital-Lifestyles is an example of this. We made the decision to entrust our phone number – the telephone gateway to our business – to Skype – We’re living the Digital-Lifestyles dream, right? At no time did we ever imagine that we’d have to change our number – ever. That’s not how phone numbers work. You’re given a number, and that remains your number until you decide to give it up. It doesn’t give you up. It’s clear that Skype has either fallen out with their current telecoms provider, or have found a better deal elsewhere. Making their customers pay for this, is not the way to do business. As if the need to change numbers wasn’t bad enough, Skype casually drops late in the email that the number that you need to change to might not be a Central London number, but the far less desirable Outer London 0208 dialling prefix, or even the near-unused 0203. Skype is offering 12 months free use of the SkypeIn number in return for the ‘inconvenience’. What is strange about this, is that Skype is very actively trying to encourage the use of Skype in business, building in features into the software to encourage this. Quite how they think they can encourage people to become dependant on their SkypeIn service and they pull a prank like this is beyond us. Skype has seriously shot itself in the foot with this. Those who have to change their number against their will, will never trust Skype again. Skype sign the email off “The (really, really sorry) people at Skype.” No matter what it costs Skype to make sure this doesn’t happen, they must meet it or they’ll end up being far more sorry than they could imagine when people abandon their service. This is a very, very dumb move. A huge f*** up on their part. Total lack of loyalty from Skype. I won’t bother renewing my Skype In number. I have had a skypeIn 0207 number for several years and use it as my main business number, I’ve just re-newed it for a another year…. Now I have 3 weeks notice that I can’t use it any more, it was only 3 weeks ago that I bought another 12 months. Skype make and are worth millions, they’ve fu*cked me over and a lot of other people as well. They have the means to keep their promises but don’t want to. I just got back from China where I had thousands of flyers and posters printed…all with our 0207 Skype number on them. These flyers and posters are now totally useless – what does Skype suggest I do with them? Can the number be redirected? Our investigation today came up with one telling piece of information – Skype does not have a hotline to call!!!! If anyone comes across a number to reach them on, please let us all know ASAP. We live in a digital age. Numbers can be kept and switched and patched and redirected and what not. And that stuff is much simpler than VoIP. So this can only be about money (Skype) or power (government). Hence, the user is the loser in the UK/Europe, as it has always been. This would never be possible in the US. Good luck Skype, you will need it! Absolute tossers !! I have had my vehicle with graphics business cards etc. I am so pissed off ! How do we sue them where does it say in there terms they can do this !! I say use Vonage – screw Skype they are twats ! Maybe a class-action suit would be a way forward. 3 weeks is shocking. The considerable expense in time and communication is enormous on any business, coupled with the loss of busines. I just read this email and had to check on Google that it wasn’t a hoax. This is so thoroughly unprofessional that it’s ridiculous. Thankfully I only just got my SkypeIn number so I haven’t disseminated it widely, but if I had I’d be furious. I’m now in two minds about whether to just move to a different VOIP provider. This is outrageous, I can’t believe this is happening! 6 months notice would be bad enough, but 3 weeks – words can’t describe how pissed off I am right now! I just renewed my number that I have been using for a couple of years so this voucher that they have sent is not a gift as I have already paid for a years service. This is going to cost me a fortune, like other people I have my phone number printed on everything and have been advertising heavily as Christmas is the busiest time of year for me (like most companies) and now my number will be disconnected it’s like I’m having to start up all over again. I’m not impressed and I’m going to seek legal advice. I have been trying to contact Skype but they never reply to my messages, I guess I will have to use their forums (if they will let me login, they won’t allow me at the moment). How stupid is it that Skype don’t have a phone number to call them on? This is a telecommunications company without a telephone number for customers! I would recommend to anyone thinking of using Skype to keep away, they will screw you over big time! If you are in the same position as me I would suggest you contact Ofcom. Telephone providers have to transfer (port) your number if requested so it should be possible to transfer your number to a BT line, I’m going to look into this! Thanks Skype, you have just ruined my families Christmas! We only purchased our 020 Skype number about 8 months ago and have had it put on all of our vans, our headed note paper, invoices, business cards, compliment slips and banners. We have also invested thousands of pounds on Yellow Pages advertising, not to mention other adverts and leaflets that we are currently in the process of distributing. Before ordering our Skype number we contacted Skype several times to verify that our number would be ours to keep for as long as we needed it, on every occasion we received a response ensuring us that we would be able to keep our number for as long as we wanted. Now today we received a notification email stating that our number will be terminated in less than a months time. This is no way to treat customers, I would never dream of treating my customers like that. The saddest thing is that it’s going to be self employed individuals and small businesses that are going to get hit in the pocket. I wonder how many will end up going bankrupt because of this? Skype really need to sort out their problems with their suppliers to ensure we can keep our numbers otherwise they will lose loads of customers, and rightly so. I agree with the comments above, I’ve asked for a WHY from Skype, but reading the comments I’m now not expecting much of a response. Does anyone have a copy of T&C’s for SkypeIn numbers as I think there should be compensation for investment in stationery and livery. I would like compensation for loss of business and disruption but doubt there’s any milage in following that one. Does anyone know what will be heard on our numbers after the 20th Dec – any reasonable business that changes number either forwards or as a minimum has a message giving new details. Will you now get the recently opened newsagents or some poor residential customer. Basically we’re screwed….. extract from T&C’s below and as long as this has been on their T&C’s website for 30 days or more we have all automatically accepted it (may have been there for years….). So suggest we vote with feet. Allocation of SkypeIn or Skype To Go number. If you have bought and are eligible for a SkypeIn/Skype To Go number, it will be allocated to you as soon as reasonably possible after you have paid us. In certain countries, the number may be allocated to you by Skype’s partner instead of Skype, and you may need to enter into a separate agreement with such partner. You acknowledge and understand that the allocation and distribution of the number does not constitute any transfer of any property or other rights with respect to the numbers. If a SkypeIn number is allocated to you by the administrator of a Business Control Panel, the right to use the number and the cancellation of such right will be exercised made at the administrator’s sole discretion. Skype shall try to allocate and distribute the requested number and enable you to be reached by PSTN Users on your number, where applicable. However, Skype cannot guarantee that the requested numbers can be allocated or distributed to you or that you can make use of the underlying Skype products. Skype is entitled, without any liability, to refuse, change or terminate any number at any time, in particular, if you don’t comply with the provisions of this agreement, the instructions given by Skype and/or its partners, and the requirements of the relevant national number plan. In the event that Skype changes the SkypeIn number that has been allocated to you, Skype will send a notification by e-mail, stating the effective date of the change and your new number. If you do not wish to accept this new number, you are entitled to terminate your number, in writing or by e-mail to billing@skype.net, with effect from the date on which the new number will be allocated to you. Skype will not be liable for any damages resulting from the change of number. I renewed the 0207 number that I had for just over a year just 11 days ago and just had more stationery printed at a cost of over £200. I complained over 24 hours ago, but have received no reply. (1) If according to their blog response, they knew of this potential situation some time ago, why didn’t they at least warn you when renewing recently (2) Having renewed 11 days ago, the offer of 12 months Skype in represents just 11 days subscription – 14 Euro cents (3) Be warned, these numbers don’t appear to work as fax forwards to a VoIP based fax to email service. Well guys, I am in the same position as all you. We have recently spent 30k on Marketing DVD’s that have been sent out last week for xmas. I have an idea. Lets all get together and start a small fund. The fund will be used to sue them. There is no point screaming and shouting, they have made their decision. The way forward is not to write anymore derogetory comments on here, but let’s all join in and sue as one body. The media interest will be huge. If we cannot beat them, let’s try and ruin their reputation by legal process. I am willing to pay privately to try and get a court injunction to stop them cutting our numbers on the 20th. This article from The Register provides the actual owner of the Skype 0207 numbers. So we do have a way foward. then tell them your story guys..
Well I have the same problem. Why not sue them? Obviously, they need to deliver what I paid for and if they fail, need to reimburse all costs. Very easy. If anyone seriously thinks of this get in touch. No government nor little skype can succeed with this scam. Looks like skype made a mistake and sold numbers for a year without having a contract for that year. Sounds quiet naive to me. I’d feel pity if they are really THAT naive. Since skype is owned by ebay, they should have enough money to cover all damages. Thank you for your interest in retaining your Skype numbers after the 20th December through GCI Com. We are working as quickly as possible to facilitate moving your numbers onto GCI’s account. I’m only a residential user, but I’ve just renewed my SkypeIn subs up to 20/12/08. Now hey’re taking away my number and forcing me to replace it with another one – which they say is free but it expires on 22/11/08 – so they’re actually depriving me of 4 weeks of SkypeIn that I’ve already paid for – and they call this free! I call it daylight robbery. I’ve just got a reply from me sending a serious complaint about losing my 0207 number and the cost of reproducing my business cards and promo materials. This is what it said…. Skype can only be held liable for direct damages resulting from an attributable failure to perform its obligations under these Terms of Service. Direct damages in this respect exclusively mean all reasonable costs incurred by you in order to (i) have Skype perform its obligations under the Terms of Service or (ii) to prevent or limit such costs. 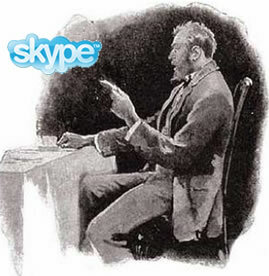 To the maximum extent permitted by applicable law, Skype shall not be liable for any indirect, special, incidental or consequential damages whatsoever (including but not limited to, damages for loss of profits or confidential or other information, for business interruption, for loss of privacy arising out of or in any way related to the use of or inability to use the Skype products, even if Skype has been advised of the possibility of such damages. The direct damages as meant in this article shall be limited to the amount actually paid by you for the Skype services during the year in which such damages occur. In no event, however, shall the total compensation for any direct damages exceed 5,000 Euro, unless the loss is due to Skype’s willful default or gross negligence. Skype is entitled, without any liability, to refuse, change or terminate any number at any time, in particular, if you don’t comply with the provisions of this agreement, the instructions given by Skype and/or its partners, and the requirements of the relevant national number plan. In the event that Skype changes the SkypeIn number that has been allocated to you, Skype will send a notification by e-mail, stating the effective date of the change and your new number. If you do not wish to accept this new number, you are entitled to terminate your number, in writing or by e-mail to billing@skype.net, with effect from the date on which the new number will be allocated to you. Skype will not be liable for any damages resulting from the change of number. What do they mean if _I_ wish? They cancelled the number I’d only just extended for a year and then ask me if I want them to do that? I am also getting PAYPAL to refund my money (which went to Skype) and they are ignoring the calls. Now I have wrote to my MP. Please write to your MP. Easy process and took 24 hours to move my number from Skype (also cheaper). @Chris – I’m totally with you …. we switched to VoipFone last week- and have, to date, found the service far superior. If it’s just a question of cost, at least Skype could have just put the price up for 020 7 nubers. That wouldn’t exactly have pleased people but it’s better than taking the number away. This is clearly unfair and Skype reckon they can just get away with it!…There are various laws all over the world which prevent this sort of behaviour…even their terms are unfair, and there are laws against that too. If there is enough interest i will start a class action…If you are interested make a comment to that effect below, and if enough people put their heads up ( as opposed to the hands), i will post someway we can all get to gether and get some of our money back. There is no such thing as an inner London area code, and hasn’t been since 2000. There is no such thing as an outer London area code, and hasn’t been since 2000. There is no such prefix as ‘0207’. Likewise ‘0208’ and ‘0203’ do not exist. The single (020) area code covers all of London and all local numbers have 8 digits. Numbers beginning (020) 70xx, (020) 71xx, (020) 80xx, (020) 81xx, (020) 3xxx can be anywhere in London as they are new numbers issued after the Big Number Change. It is true that *most* other (020) 7xxx numbers are in inner London (because they were previously 0171 numbers), and most other (020) 8xxx numbers are in outer London (because they were previously 0181 numbers), but all of these can now be allocated *anywhere* in London.